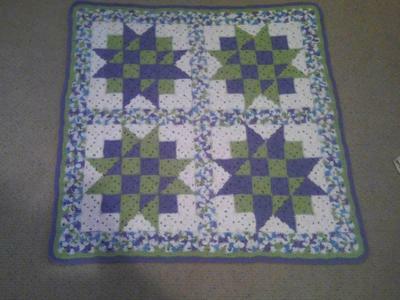 This is a quilt inspired granny square blanket made out of super cuddly, yet machine washable cotton yarn. I made this with Bernat's Cottontots yarn. Cotton is a great choice for baby gifts because it's machine washable and the Cottontots is extra soft and squishy. I love how the varigated resembles printed fabric, reinforcing the quilting theme. I always use Susan Bates crochet hooks. I am in love with their hook design versus other brands and because my mentor and crochet instructor, my 6th grade teacher, prefered them. This is a Happy Yellow House quilt inspired granny square pattern. I choose this pattern because I've always had a facination with quilting and I love the way the granny squares mimic piecework. I picked gender neutral colors because my best friend wanted the gender of their baby to be a surprise. I love the varigated squares!